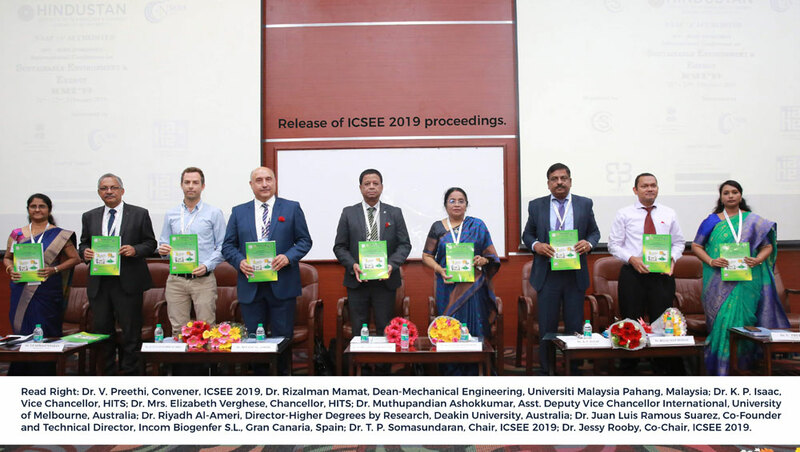 The department of Civil Engineering of HITS, organized SERB, a DST sponsored 2 nd International Conference on Sustainable Environment and Energy ICSEE 2019 on 21 and 22 February 2019. The Chief Guest of the conference was Dr. Muthupandian Ashok Kumar, Asst. Deputy Vice Chancellor International, University of Melbourne, Australia. The Guests of Honors were Dr. Rizalman Mamat, Dean-Mechanical Engineering, Universiti Malaysia Pahang, Malaysia; Dr. Riyadh Al-Ameri, Director-Higher Degrees by Research, Deakin University, Australia; and Dr. Juan Luis Ramous Suarez, Co-Founder and Technical Director, Incom Biogenfer S.L., Gran Canaria, Spain. Dr. Mrs. Elizabeth Verghese, Chancellor, HITS presided over the function. The conference drew out an interactive exchange with reputed field expert scientists both within the country and abroad. The conference provided students and scholars a chance to publish their research work on Hydrogen Energy in the peer-reviewed International Journal of Hydrogen Energy (Elsevier Publisher). The one-day conference had unanimously agreed that a research and development based on novel methodology, efficient materials and sustainable process play a vital role in the societal development. During the conference inauguration, an MoU was signed between HITS and Universiti Malaysia Pahang, Malaysia.